Toss the Teddy Grahams and box of chocolates this Valentines Day and head straight for these yummy healthy Chocolate Sweetheart Cookies. Of course you can switch up the shape for occasions. These are a perfect way to satisfy your chocolate craving. Use little cutouts for just the perfect portion. *I recommend agave or brown rice syrup. You will need more if using brown rice syrup less if agave. With a mixer on low, beat until well blended. Gradually stir in flour mixture (dough will from a ball). Divide dough in half; roll out each on parchment paper to 1/4 inch thickness. Freeze until firm, about 20 minutes. 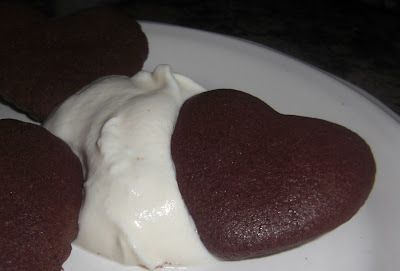 Using cookie cutter, cut out cookies. Place on buttered baking sheet. Bake 7-10 minutes. Be careful not to overcook. Transfer to rack to cool. Dip and serve with Agave Whip Cream. Combine in metal pan. Blend until firm. 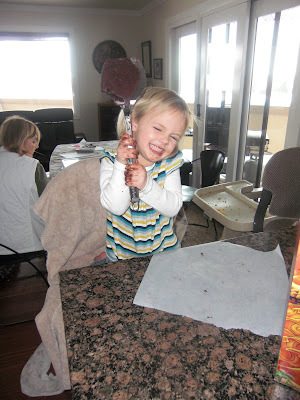 Callista was going a bit crazy with the dough. She got quite a bit on herself, but some made it into the oven. 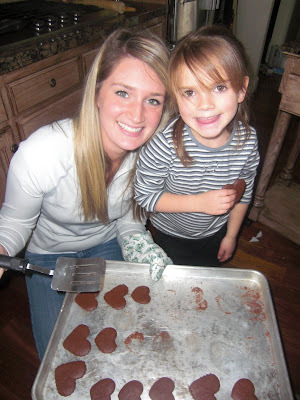 Ellery and Aunt Amy...notice we didn't butter the pan...opps. Don't forget!